3. Fish and other sea life in the Gulf are still struggling after the disaster. The death toll for dolphins and whales in the Gulf may have been 50 times higher than the number of bodies found, according to a recent paper in Conservation Letters. Earlier this year, a large number of dead dolphin calves were found on the coast, and scientists have linked many of those deaths to the oil disaster. Anglers are also reporting dark lesions, rotting fins, and discoloration in the fish they're catching in the Gulf, as the St. Petersburg Times reported last week. 5. Congress hasn't changed a single law on oil and gas drilling in the past year. A year later, the liability cap for companies that cause a major spill is still just $75 million, companies with dismal safety records can still obtain new leases, and they can still avoid compensating families when workers die on rigs. 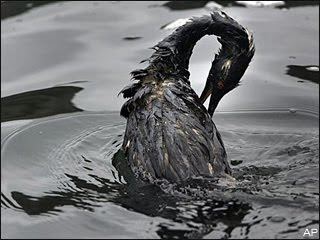 In January, the National Oil Spill Commission released 300 pages of findings and recommendations that Congress has largely ignored. 7. "Fail safe" technology isn't fail safe. The blowout preventer (BOP), the device that was supposed to stop a catastrophic spill after the explosion on the Deepwater Horizon, failed due to a faulty design and a bent piece of pipe, according to a report released in March. The Bureau of Ocean Energy Management, Regulation and Enforcement contracted the Norwegian firm Det Norske Veritas to conduct a forensic examination of the BOP. The blind shear rams, which were supposed cut through and close off the well, failed because a pipe had buckled, the 551-page report concluded—a problem that casts doubt on all the other BOPs in use today. 8. The country's offshore regulator has a new name, but it's still got plenty of problems. The much-maligned Minerals Management Service (MMS) got a branding overhaul and is now known as the Bureau of Ocean Energy Management, Regulation, and Enforcement (BOEMRE). And while it's made a number of changes in the past year, there are still plenty of concerns about whether the agency is up to the task. Interior Secretary Ken Salazar and BOEMRE head Michael Bromwich acknowledge that it will take years of reforms to ensure that drilling is safe for workers and the environment. 9. Fewer than half of people who have filed claims from the spill have been paid. The Gulf Coast Claims Facility, under the direction of administrator Kenneth Feinberg, has approved approximately 300,000 claims out of the 857,000 it has received from individuals and businesses, totaling $3.8 billion. The claims facility cited the "unprecedented magnitude of the task" in its announcement marking the year since the spill. A number of residents have grown frustrated with the process and say they would rather sue than wait on the claims facility. 10. BP still doesn't want you to see its tar balls. That's right—even a year later, BP is still blocking reporters from the beaches.